Reading the Fantastic Four comics from the start. Issue #373 packs a ton of story into one comic. But is any of it a good story? To recap: Aron the rogue watcher kidnapped Alicia, and used her to trap Reed, Ben, and Sharon Ventura in a “perfect” alternate reality based on Alicia’s subconscious. To rescue Alicia, Puppet Master has mind-controlled the Molecule Man to do his bidding. Meanwhile, Johnny is a fugitive after destroying part of Empire State University in a superhero battle. 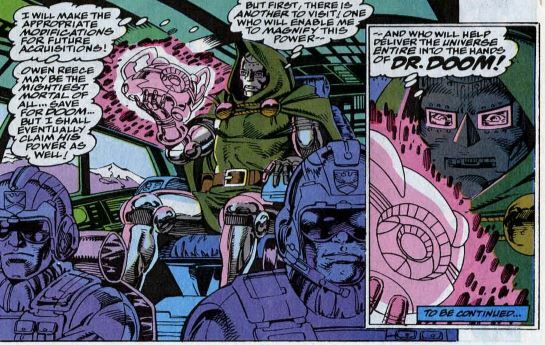 We begin with Dr. Doom in his lab in Latveria. 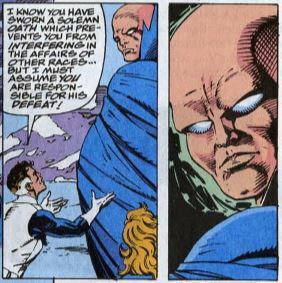 One of his underlings tells him that they’ve lost track of the agent Doom sent to infiltrate the Fantastic Four. Doom says he already knows, and he’s aware that “star-spanning power” is at hand. 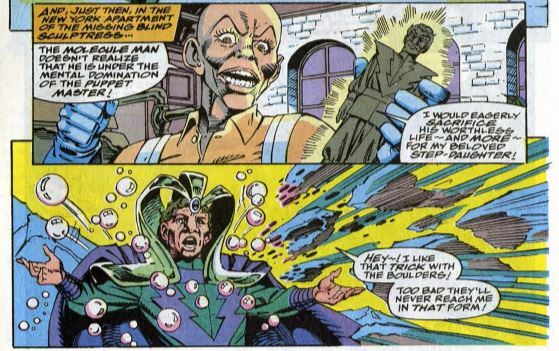 Elsewhere, the Puppet Master has mind-controlled the Molecule Man, using him to attack Aron and hopefully rescue Alicia and the others. They fight outside Aron’s mountaintop lab by bringing the environment to life around them, for some trippy visuals. We cut to the alternate reality where Ben, Reed, Alicia, and Sharon have been trapped. In this world, Ben is a human, married to Alicia, and he works for a huge company alongside Reed and Sharon. Ben is having nightmares and feels like he’s being watched. Ben transforms from human back into the Thing, just as Reed and Sharon discover their powers as well. Alicia appears, seemingly knowing what’s happening, saying not to jeopardize this perfect life. 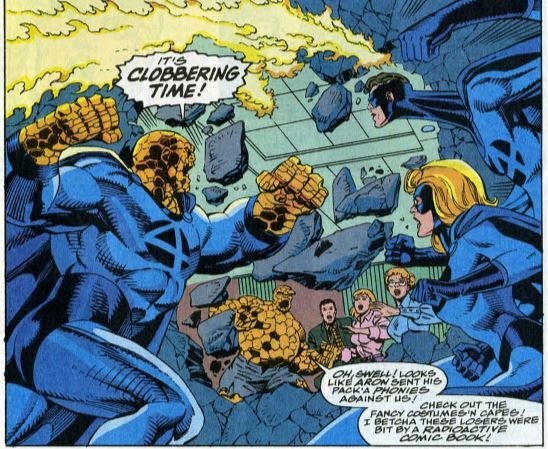 They’re then interrupted by this world’s version of the Fantastic Four, wearing uniforms with masks and capes. Back in NYC, Sue is meeting with attorney Matt Murdock in hopes of getting Johnny out of legal trouble. Murdock says there’s not much he can do as long as Johnny is a fugitive. He hints, however, that he has other talents that might help. From there, we meet up with Silver Sable and the Wildpack, mercenaries who have been hired by J. Jonah Jameson to hunt and capture Johnny. 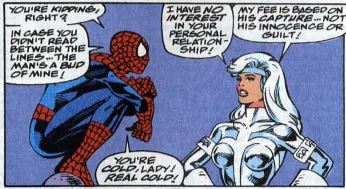 Spider-Man shows up and confronts Sable, saying that Johnny is his friend. The Wildpack finds Johnny and, with their flying jetpacks, chase him around the city. He fights back and escapes. On the mountaintop, Aron defeats the Molecule Man by sealing him in a vacuum, where there are no molecules for him to manipulate. (I fail to see why Molecule Man doesn’t use the molecules in his clothes or even his own body. I guess he didn’t think of that.) This knocks him unconscious and severs his connection with the Puppet Master. 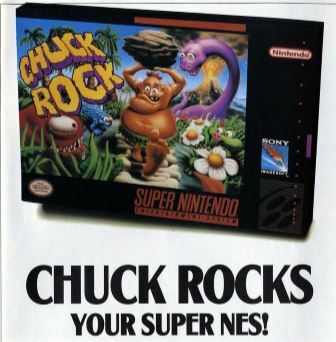 In Aron’s alternate universe, Ben, Reed and Sharon are easily able to defeat the alternate FF thanks to their years of experience. Alicia freaks out, not knowing what is real and what is a lie. Her emotional breakdown is what causes the heroes to escape from the other universe and return to Earth. Outside, Aron is momentarily distracted by the goings-on in his lab. Dr. Doom appears and makes the most of this and attacks Aron with an energy-syphoning device he just happens to have. Inside the mountain, Reed frees Alicia from Aron’s lab, and she is okay, if upset over what she saw in the other universe. The heroes go outside to find the Watcher standing over the comatose Aron. Reed asks the Watcher if he’s the one who defeated Aron, but the Watcher stays silent, just watching. In New York, Matt Murdock has donned his Daredevil uniform, and he watches from the shadows as Spider-Man meets up again with Silver Sable. Sable asks Spidey for his support, but Spidey swings away, saying that he needs to sort out his priorities and that it’s time to call in “the really big guns.” Elsewhere, the Molecule Man recovers and flies back home. Dr. Doom is also on his way back home, with his syphoning device pulsating with power. He says there is “another” he must visit to magnify this power, after which Doom will rule not just the world, but the entire universe. Unstable molecule: Reed says the alternate universe version of him bears “a vague resemblance to that fictional super hero who died amid so much media ballyhoo!” That’s a very mild shot fired at DC over the then-recent Death of Superman event. Fade out: In addition to meeting with Matt Murdock, Sue is also meeting with Makio Yakaki, the FF’s financial advisor (this character’s first appearance). Sue, in her new take-no-prisoners attitude, informs Makio to “buy off” Empire State University to clear Johnny’s name. Clobberin’ time: The big dramatic moment in this issue is Ben revealing to Alicia that he still cares about her, in real life and not just in the alternate universe. We’ll have to see how much of a seed this plants in them eventually getting back together. 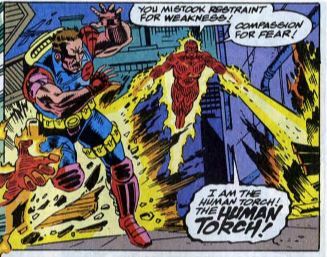 Flame on: This story arc continues trying to paint Johnny as a dark antihero, by having him lose his temper as he fights the Wildpack, boasting about how they’re nothing compared to his power and experience. Fantastic fifth wheel: Even though Sharon is the one who dumped Ben, in this issue she’s broken up about him being affectionate towards Alicia. Trivia time: Although described as a mercenary, Silver Sable is seen operating out of the Symkarian embassy. A quick re-read of early issues of Silver Sable and the Wildpack reveals that she’s both a secret agent for Symkaria and the head of her own mercenary business. That’s some serious multitasking. The members of the Wildpack, by the way, are Chen, Powell, Battlestar, Striklan, and Quentino, and a seemingly endless supply of anonymous grunts in full-face masks. The Sandman was also a member of the Wildpack for a while. 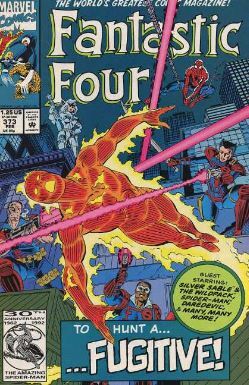 It was during this time that Marvel published five issues of Fantastic Four Unlimited. I won’t be writing full-length reviews of them, because they’re not very good. In the first issue, the FF join Black Panther for another battle against Klaw, revealing that Klaw and T’Challa’s ancestors were also enemies. Fantastic or Frightful? This run of issues has multiple storylines, multiple villains, and tons of guest stars, but it all feels frustratingly directionless. It’s challenge trying to find those scant few moments of character development during all this. Next: It’s a New world.